Vehicle wrecks can happen at any hour of any day of the year. You need to act fast if a truck in your fleet has an accident. If the truck releases cargo, liquids or fuels, the urgency increases. When spills occur on roadways, state and local authorities demand quick action in order to get the highways opened and traffic flowing again. Here are eight points to consider when you find out one of your company’s vehicles has been involved in a wreck. First: Find out if anyone has been injured. This is a critical question to ask; those injured on site can include the driver of your vehicle or possibly other drivers or pedestrians who have been affected as well. Second: Find out what was spilled and how much. Commercial trucks carry dozens of gallons of fuel, oil and other engine fluids but the cargo involved can also weigh heavily on how the operation should be approached. The cleanup of a truck hauling soap would be very different from a truck hauling a flammable chemical. Third: Determine what areas have been affected by the spill. Materials spilled onto concrete may run onto soil or reach storm drains and flow into waterways, resulting in the need for a more wide-ranging cleanup strategy. Fourth: Contact a reputable, professional spill response company; preferably one that has been awarded response contracts by government agencies after a strenuous bid process. The governmental bid process in today’s competitive world considers value, experience, reputation, reliability and knowledge of rules and regulations. Most governmental agencies set an extremely high bar of accomplishment today more than ever before. Be careful of companies that make false claims to be official contractors for state and local entities. If need be, ask a fire department or transportation representative on site who their own contractor is. Fifth: Make sure that the selected contractor is transparent about who they are and what their record is. 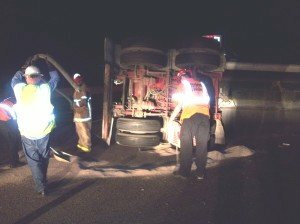 Some cleanup companies will periodically change their name to escape a bad reputation or team up with local tow truck companies to take advantage of transporters who’ve had wrecks by using unnecessary equipment and exaggerating costs. They’ll also sometimes say that they have X number of years of experience. Remember; ten employees with six months experience doesn’t equal a company with five years of experience. Sixth: Look up the website for any company you might consider using. Check their representations out thoroughly and search for their physical locations to make sure they have branch offices where they claim to. Otherwise, the response team may not come from a location that is close to the incident and this could add delay and expense to the cleanup. Look for the same local phone number listed for all the alleged locations. Typically it’ll be a cell phone number and the claimed locations are fictitious. Seventh: Be sure the contractor will handle and dispose of your waste in accordance with the law and your wishes. The responsible party remains liable for the disposal of any wastes generated from the cleanup so if the contractor mishandles or disposes of waste in an illegal manner, your company will face fines for their actions. A tremendous number of cleanup crews have no idea how to legally dispose of wastes. Be careful and inquisitive. Match your waste volume quantity to what’s on the manifest and if it differs make them correct it. Eighth: Review contract agreements carefully before signing them and be wary of gimmicks or promises of immediate results. Expert knowledge and dedication are the keys to successful spill containment and cleanups. Protect Environmental Services has specialized in Hazardous Materials cleanup and disposal for 18 years. Our expertise if focused on handling complex and potentially dangerous cleanup operations in a variety of locations including roadways, warehouses, shipping terminals and airports. 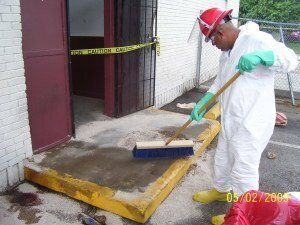 Since 1996, our company has responded to over then thousand separate incidents ranging from small bio-hazard cleanups to large, multi-month remediation projects. We invite your company to contact our offices and get to know how we can help you if the time comes. You may not have time to do a thorough vetting process immediately after a wreck so building a relationship with your response contractor before an incident occurs can be very beneficial. When you make Protect Environmental a part of your contingency plan, you can be confident that your incident will be handled with professionalism by people you know and trust at a time when your company is vulnerable.